The clothing industry is one of the oldest industry, yet it is one that has seen and still going through a lot of changes in the sense of design, trend, occasion, season among other factors. Everyone likes to buy clothes whether online or offline. We all want to stay with the trend and look good in our clothes. But are all these clothes safe? Clothes come in all colours. The bright colours are all imparted to the clothes through the dyeing process. Current methods all employ chemicals dyes to bring out the required colour. The process also uses an immense amount of water and by the end of the process, the water is all dirty. In this world of depleting resources, wasting an enormous amount of water does not seem wise. It has turned the attention of people to find ways of making clothes which are not harmful to nature or its wearer. Researches have been underway to make eco-friendly, sustainable clothes. One need not look too much into future for an answer, but rather to the past. Ayurvastra, a new concept to the world, but it was the way of clothing in ancient India, especially Kerala. 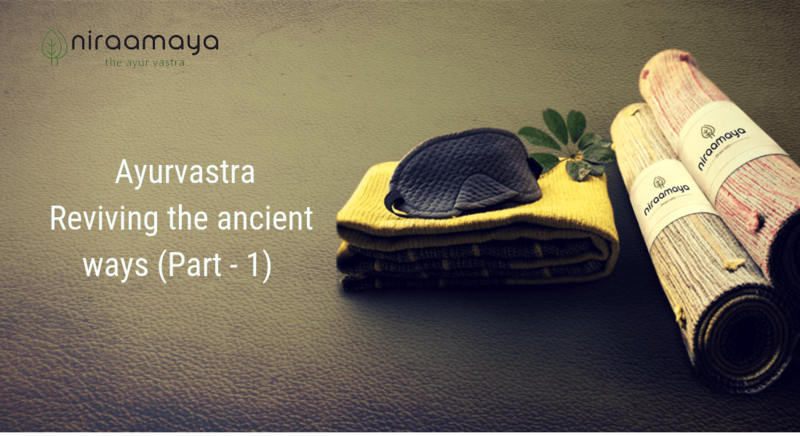 Ayurvastra is a Sanskrit word roughly translated to healthy clothing or herbal clothes. It is a way of making clothes using natural dyes with zero or minimal impact on nature. One can say that it is the most nature-friendly, safe and sustainable clothing. The making of herbal clothes starts with bleaching of the pure cotton or yarn with concoction based on cow urine. Cow urine has many herbal qualities. The cloth material is then dried under direct sunlight and a gumming paste made of aloe vera and camphor is applied. The material is then dipped into another concoction made of many medicinal herbs. This concoction acts as the dye. The gumming paste is used to hold the dye to the clothes. After dipping it in dye, it is left to dry for 3 days. Then the fabric is kept in a room for “seasoning”, a method to ensure the concoction has settled in deeply. After 15 days the cloth is taken out to wash and it is dried in shade. Another seasoning of 15 days follows. The process of dyeing clothes is a task requiring manual labour and qualities like attention, timing and consistency is very much needed. Wait for the next blog to know more about ayurvastra! 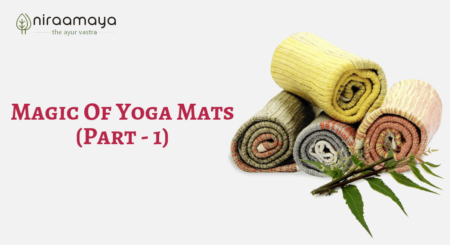 Posted in Uncategorized and tagged ayurvastra, ayurvastraclothing, ayurvastrafabric, ayurvedicclothing, ethicalclothing, niraamaya, organicclothes, organicclothing.